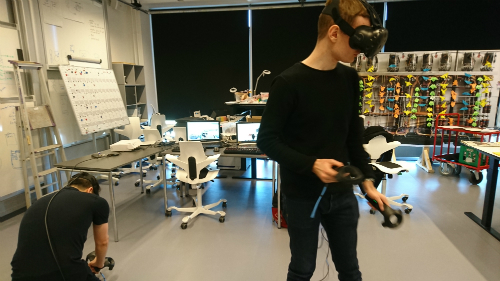 A new project by two UCPH graduate students at the Department of Computer Science is combining the latest virtual reality research and inspiration from computer games to test buildings in life-like situations before the first spade of dirt is ever shovelled. Their work has the potential to improve many types of building projects, including emergency rooms, fire stations and airports, where acute situations demand quick and collaborative action. While building plans may look great on paper, they may not perform quite as well in practice. Unfortunately, these failures are often noticed only after a building is up and comes into use. Two computer science students from the University of Copenhagen’s Department of Computer Science are now addressing this problem in their thesis work. Using virtual reality (VR) and the latest computer gaming technology, they will investigate whether it is possible to test collaborative situations in buildings, a hospital for example, and apply the results as early as the architect’s design phase. While virtual reality is already used to experience building plans prior to construction, the two graduate students will examine whether VR can be deployed to test plans within the context of challenging situations. This will make it possible to evaluate how well blueprints support human collaboration in Denmark’s ‘super hospitals’ of the future. "We will look at how virtual reality can be used in real life situations where cooperation is paramount. Using the New North Zealand Hospital as our case, we will develop digital scenarios that involve equipment and people to explore how designs actually perform. This could be within the context of a cardiac arrest or any type of critical situation where many people must communicate and cooperate," according to graduate student Mark Wulff. "For us, actively using VR as a communication and planning tool is a natural part of something as complex as hospital construction. This is valuable for contractors, in relation to their familiarity with structures, as well as to hospital staff, in relation to their specific workflows. It is exciting for us to chart the possibilities with regards to specific hospital spaces that need to function with numerous and changing workflows among various groups of staff, particularly in acute situations. We are delighted to learn from this exciting research project," says Project Director for New Hospital North Zealand, Henry Schødts. He adds that it will be exciting for the new hospital to see how VR contributes to good work processes among employees and ultimately, to meaningful patient experiences. “How can one determine whether a future space will be organized in such a way that staff do not interfere with one another during an emergency situation arising from acute patient need? Can one be certain that the necessary equipment is readily accessible and at the right moment? This can be difficult to anticipate. Thus, it is exciting that our two graduate students are exploring the possibilities of gaming-based techniques to develop virtual reality simulations for testing specific collaborative scenarios in hospital design," says Naja Holten Mills. The research perspectives are immense. Hospitals, emergency rooms, airports, fire stations, factories and other buildings are designed for specialised purposes and require attention to how their physical environments are experienced by a wide range of future employees. If it is possible to test some of the most complex types of collaborative scenarios, virtual reality has the potential to have a fundamental impact upon the construction industry as a whole.